MANILA, Philippines - "Eat Bulaga's" segment "Kalyeserye" has undoubtedly catapulted Maine Mendoza to fame. And her ever growing army of social media followers can attest to her ever-growing popularity. 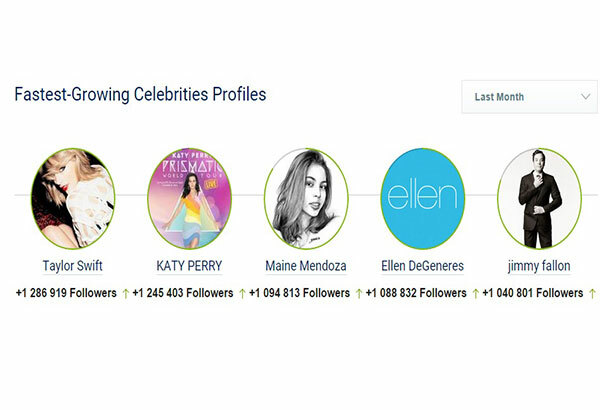 With a total of two million followers on Twitter, Maine Mendoza, also known as Yaya Dub, was ranked by socialbakers.com as third on the list of fastest-growing celebrity profiles on Twitter worldwide for September. According to the Twitter monitoring site, Maine has gained 1,094,813 followers in just a few months, placing her behind two of the world's most famous singers, Taylor Swift and Katy Perry. In terms of location, Maine ranks first on list of fastest-growing celebrity profiles on Twitter in the Philippines, for this month. Coming in at the second spot is her onscreen partner Alden Richards, who gained a total of 933 896 followers. The tandem is followed by fellow fellow "Eat Bulaga" mainstay Joey de Leon in third place and Vice Ganda of "It's Showtime" in fourth place. Meanwhile, the website says Anne Curtis'Twitter account still has the largest audience in the Philippines with over 8 million followers at present, followed by Angel Locsin with 6.8 million followers and Vice Ganda with 6.08 million followers. The website based the rankings on three categories: the total number of profiles followed from a specific Twitter profile, the total number of followers of a specific Twitter profile, how likely a user is to recommend a page/profile within his or her network.